"Justice" is the buzzword for this week's episode of Scandal, but the characters had puzzling ways of pursuing it. Here are five surprises from last night's installment. 1. Papa Pope is back … and he's playing stupid. 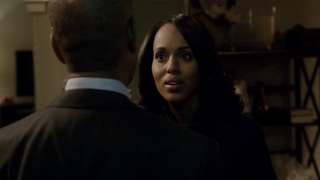 Last week Papa Pope used Olivia Pope's new lover, Russell, to trick her into opening her door for him. This week's episode kicks off with Papa Pope inside Olivia's apartment helping himself to some of her wine and using sideways psychology to get Olivia to stop David Rosen & Co. from bringing him to justice for the crimes he committed in his capacity as command of B613. "I'm just a paleontologist at the Smithsonian," but people are after my head for some "top-secret spy organization called B613 … " Well, that's different. Olivia says that she believes in justice—even if it means that both Fitz Grant and her father have to go down in its pursuit. Papa Pope is surprised that, for the first time, Olivia isn't prepared to use her body (and soul) as a shield to protect Fitz. To him, this means she's finally realized that Fitz is just a man like any other: "No matter how far you run, no matter how white the knight, all men are like your father." Regardless, Olivia doesn't plan to lift a finger to save Papa Pope, because of her commitment to justice and the Republic. All Papa Pope hears is "Yadi yadi whoopty whoo." He gives Olivia 48 hours to shut down this B613 witch hunt … or there will be blood. Meanwhile, Papa Pope has left Russell drugged and bound behind Olivia's couch. As Russell regains consciousness, Olivia gives an Oscar-worthy performance in trying to convince him that he simply had too much wine. The Popes simply cannot be trusted. 2. Vice President Susan Ross is smarter than you think. Mellie Grant and Fitz intentionally selected Susan Ross to replace Andrew Nichols as vice president because she seemed a bit scatterbrained, which would prevent her from posing a formidable challenge to Mellie's forthcoming presidential bid. When the White House needs Susan to break a tie in the Senate vote for Fitz's "Brandon Bill," which would institute police reforms in the wake of the killing-by-cop of unarmed teen Brandon Parker a few episodes ago, Susan refuses to vote on it despite bullying by Fitz, Cyrus Beene, David and Mellie. She argues that the bill is useless without any oversight and enforcement mechanisms, and ultimately she convinces Fitz to rewrite it so that it will actually do some good. Way to be, Susan. Since her insistence on actually making a difference stalled the Senate's vote on the bill, Fitz creates a diversion and buys them some time by formally announcing Mellie's Senate run. Woot! 3. Marcus Walker isn't so righteous after all. Remember Marcus Walker, the community organizer from the Ferguson, Mo.-inspired episode who pulled Olivia's black card for not being "down enough" and questioned her moral compass? Well, this week he shows up as Olivia's client. In the middle of his mayoral race, he was sleeping with the wife of his opponent—the mayor—and was hiding in her closet when three men came into her bedroom and murdered her. The gladiators clean up the crime scene (by pulverizing her body and smushing it into some luggage) and find out that the mayor had his wife killed and was trying to force Marcus to drop out of the mayoral race by framing him for the murder. Olivia suggests that Marcus blackmail the mayor with this evidence and force him to back out of the race, but Marcus' moral compass kicks in and won't let him do it, so he confesses to the affair and outs the mayor for the murder. Given his confession, I can't figure out how Olivia, Huck and Quinn Perkins don't end up in prison for illegally tampering with the crime scene and disposing of the body before the police had a chance to investigate. That doesn't seem just. Jake Ballard shows up at Olivia's office late at night to check on her, but when he gets there, he's attacked and stabbed repeatedly by … Russell! @#$&, Rowan! Papa Pope has used yet another one of his goons to seduce his daughter. Clearly, Papa Pope has no brakes. … maybe. All I know is that it wasn't looking good for our dear friend Jake. Trust and believe, however, that if Papa Pope wanted Jake dead, it would have been as simple as shooting him. Yet Russell brought a knife to what could easily have been a gunfight and kept giving Jake chances to fight back. Was Papa Pope actually trying to have Jake killed or was he just sending a message to Olivia, David, Huck and Quinn to drop their crusade against him? One thing is for sure: Papa Pope said there will be blood, and for better or worse, we know that he is a man of his word.